The boys were treated to some new shoes by my Nanny last week. 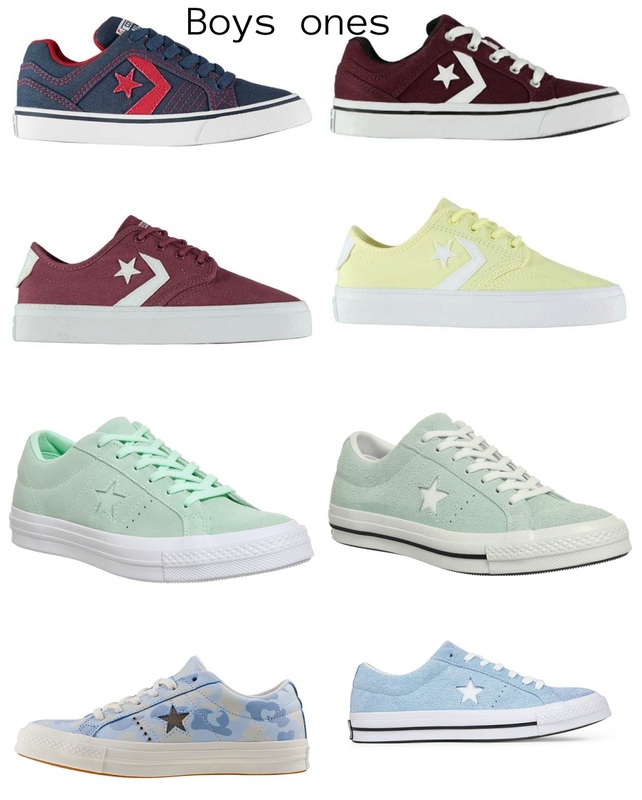 They chose a pair of Converse each (the top ones on the collage below). I really like that look when they are matching but with different colours. Harry really wanted me to get the same as him as we found an adult version. His are the Burgundy ones. As much as I really like the Burgundy ones I have also been torn between those, the turquoise and mint ones, as well as the yellow and the blue camo print. I haven't quite decided if I will get a pair yet, I am a bit of a cheapskate when it comes to shoes so would need to find them cheap to buy them. We will ignore the fact I have said I am a cheapskate when it comes to buying shoes, as my next lust for this month is Mac lipstick. I am off to Fuerteventura in a couple of weeks which means obviously a trip to the airport! Woo. For a while I have thought about treating myself to a coral lipstick, although I do have a couple of similar colours, and so have decided to research to see roughly which colours I will look out for. I don't really want to force my boyfriend to stand and shop with me for ages so decided researching before I go will equal less faffing. I also found a 10% off duty free voucher...printed myself off five of those just in case our flight gets delayed and I get more shopping time obviously...or we forget any essentials. I'd also love to get a new charm for my Pandora Bracelet from the airport, if there is a Pandora shop in there. There's no way my boyfriend would let me get a tattoo on holiday to mark our first holiday together so I think a Pandora is the next best thing. If he sticks to what he has to far threatened about embarrassing me on the plane then I think the plane will be the best one to go for. And it is kind of cute.